The initial consultation uncovers where you are experiencing problems, physically, mentally, emotionally and spiritually. During this assessment we uncover what you wish to change and I create a healing program for you. I will tailor the program specifically to your needs and it can be anywhere from 1 – 3 sessions or more, depending on what you are working on. A session in person looks like this: You relax on a massage table, fully clothed while I connect with my Higher Self and direct source energy through my hands into your chakras and subtle bodies (layers of energy) without touching you. 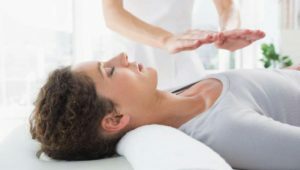 During the session, I am channeling the highest unconditional love energy through me to transform the energy in the person’s energy bodies by clearing out the old energy that is imprinted at a cellular level and raising the vibration of the client so that they can become unstuck and flow with the natural flow of Universal energy again. This clearing activates the body’s own ability to heal itself on many levels as dis-ease forms in the subtle layers of the energy field before it manifests in the dense matter of the physical body. During the session I am also using my intuitive abilities to channel any intuitive impressions that are stored in your energy system as well as messages and spiritual guidance from Spirit that I receive. These messages can come from your Spirit Guides, Higher Self, Angels, Ascended Masters, Master Teacher, Master Angels, Nature Spirits or Loved Ones to help guide you and bring you greater clarity and peace. I also use crystals and essential oils to assist with raising your frequency. The sessions release many (blocks) negative emotions (including anger, fear, frustration, anxiety, restlessness, grief, self-doubt and depression) and instill deep serenity and peace of mind. Most of my clients report that they feel less stressed, energized, lighter, happier and able to cope with whatever life throws at them, and are more tuned in to their body’s needs. Once a person has a higher vibration, they are able to manifest that which they want in alignment with their Higher Self to fulfill their purpose here on earth with joy and feeling fully connected to their heart center. I am often told by my clients that the sessions I provide are life changing. And I have heard more then once that I was able to move more in just a few sessions than traditional therapists did in years of therapy. Continued sessions will help you move forward more easily in life and maintain a happier, healthier existence as you incorporate your new understanding of your needs into your daily life.